The convenience of a crown or veneer on the same day, for a smaller cost. With many dentists, crowns or veneers can take a couple of weeks. The impression is sent to a laboratory and the dentist and patient wait for it to return. Now with CEREC, there is a one day solution. CEREC is another way of providing top quality restorations for your teeth; a state of the art CAD CAM system developed in Germany 30 years ago and is still state of the art due to continuing updates. This is the world’s leading system enabling a dentist to design, fabricate and fit crowns, veneers, onlays or inlays in a single visit: at a price effectively less than a conventional one made by a dental lab. ‍One visit – much more convenient for you, especially if it means time off work, a long journey or the work is urgent. ‍No impressions – a very big issue for some people. ‍One local anaesthetic injection – since the entire procedure can be carried out within a short time, you only need to have one lot of anaesthetic. If you wish, we can use THE WAND to make the injection as comfortable as possible. Certain procedures can even be carried out without injections. No temporary restorations – temporary crowns can be unsightly, uncomfortable and fragile. A real pain. Your teeth can move slightly in the 2 week wait and make the new crown a poor fit; not a problem in the single visit required. Complete control of the final result – since the CEREC dental crown or veneer is designed and fabricated from start to finish in the practice, we have total control over how it will look and fit. All tooth shades are totally reproducible so the colour of the tooth is easy to match and you are freed of the worry of ending up with an odd looking tooth. Matching a single tooth is easier. Have you ever seen a friend with one poorly matched tooth (crown)? Broken tooth under an existing denture – you would usually need a new denture as well; VERY expensive. We routinely make a crown to fit the existing denture and it will often even enhance the fit. 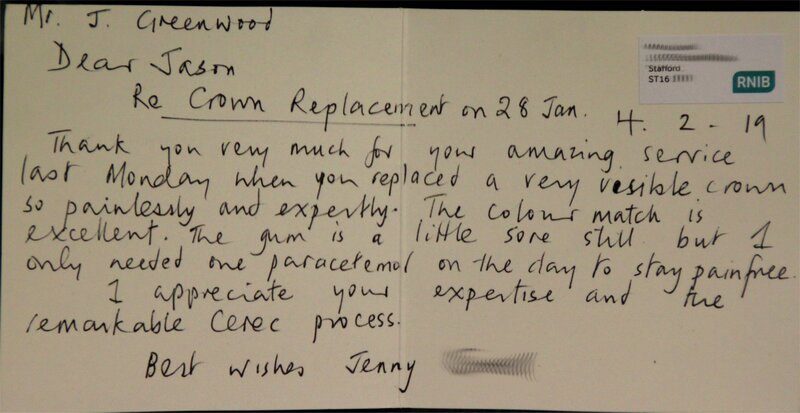 Implant retained crowns – we refer our implant cases to a local dentist with specialist skills. Once the implant has integrated we will fit the crown the same day.